Using retirement accounts can expedite Financial Independence. 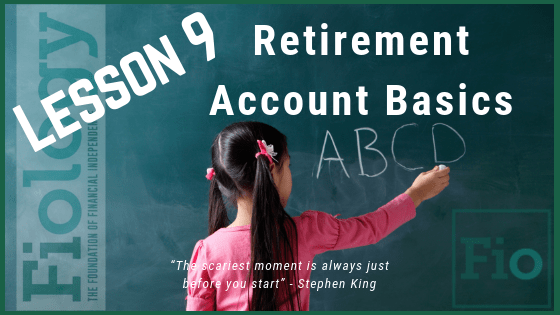 There are different types of retirement accounts and we don’t have access to all of them, but we may have one or more available to us. Many corporate employees have access to a 401(k). And most employees have the ability to initiate and contribute to a Traditional IRA and/or a Roth IRA. It is important for us to determine what plans are available to us, discover how we can initiate them, and then take action in order to maximize their performance within our financial plans. There is more information compared to previous lessons. In the material provided here, we will discover much of what we need to know about retirement accounts. With accounts including Roth IRA, Traditional IRA, SEP IRA, 401(k), Solo 401(k), 403(b), SIMPLE IRA, Thrift Savings Plan, HSA, and more, it can be overwhelming. Once you determine what accounts are available to you, it’s recommended to focus on those, for now, to help avoid getting overwhelmed or confused. After spending some time learning about what you have available to you, take action. Know what you are invested in and how much you have invested in each account. Investing in these accounts have many advantages that can support your Financial Independence journey. Read: Investment Fees Will Cost You Millions by Physician on Fire of physicianonfire.com. This is to make you aware of what to look for when you begin exploring your investment options and consider the true cost of selecting one investment over another. Take Action: Visit the ultimate authority of the Types of Retirement Plans at the IRS.gov website. Again, for now, only focus on those accounts that you have determined are available to you. While simply hearing the term “IRS” usually brings tension, their website is a great resource. Click on a few links during your visit. If you already contribute to your 401(k) at least up to the amount to receive the maximum matching contributions, consider opening a Roth IRA or a Traditional IRA with Vanguard. Do your own research on investment options. A recommendation depends on the amount of funds you have available when you initiate your account. If you have $1K to invest, consider a Target Retirement Fund. If you have $3K to invest, consider VTI or VTSMX. If you have $10K or more to invest, consider VTSAX. There are many comparable low-fee options offered by other fund companies. Please do your own research and invest only when you have educated yourself enough to be comfortable. If you have questions specific to your circumstance, please join the ChooseFI Facebook Group and ask questions there. Each person’s situation is unique. Do not take the information on this page or the links associated as gospel or directive. Learn as much as you need to responsibly take positive action to achieve Financial Independence. Additional Resources: Depending on your chosen profession, you may have unique accounts available to you. Explore: Thrift Savings Plan (TSP) official website. There are many guides and calculators. TSP is available to the military and federal employees. Public School Employee, Nonprofit Employee, or a Minister?